Because of the amethyst stone, people born in February have the ability to think clearly, intelligently and bravely. They are courageous souls who stick to their morals but aren't afraid to admit when they are wrong. February-born people are big dreamers, creative in many ways and constantly dreaming up big ideas. They can get lost in their bubbling thoughts, which is where their calm and clear thinking qualities, brought about by the amethyst gemstone can come into play and help guide them. Ancient Greeks believed amethyst stones guarded against intoxication and their name comes from ‘amethystos’ meaning ‘sober’ or ‘to not intoxicate’. The name originates from a story in Greek mythology about overindulgence, but today we interpret this as intoxication of the mind from cluttered thoughts. Amethyst is thought to help bring about emotional clarity and creativity, and to relieve mental strain and stress. Intoxication today therefore represents emotional and spiritual - not just physical - drunkenness. The February birthstone colour is purple, but amethysts come in purples that can range from deep violet and red to pale lilac and even pink. The purple colour was associated with grapes and the wine god, Bacchus. The sober quality was not to shun or avoid alcohol completely but to encourage and help keep you clear-headed and clever while enjoying a drink of wine. The stone itself has strong clarity, bearing a strong resemblance to its representation. Purple has been considered a regal colour throughout history, hence royal jewellery has often featured amethysts. It also was important in Christianity, featuring on bishops rings as the royal colour symbolised Christ. The stone today features in the British crown Jewels royal collection. In Buddhism, the amethyst birth stone for February is understood to enhance meditation, allowing us to find our inner peace, because of how it enables us to declutter our minds. As a result, it sometimes features as Tibetan prayer beads. Leonardo da Vinci wrote that amethysts enhance intelligence and protect against evil thoughts. Physically, the February gemstone has been thought to have an ability to cure insomnia and relieve pain. What is the Birthstone for February? Through time, the amethyst birthstone has been associated with peace, balance and courage. An amethyst stone has been thought to benefit wearers by giving them heightened intelligence and control over their thoughts, particularly the ability to recognise evil ones. The stone encourages calmness, stability, courage, bravery, contemplation and peace, while guarding against anger and wild and negative passion. This is why the stone is also understood to represent modest people. It calms the negative parts of a person's nature to bring about only the good, and with all these positive traits comes modesty. People with the Feb birthstone have strong relationships and they love making new friends. They adapt from being quiet and shy to confident and argumentative depending on who they are around. They remain the same in their heads but, externally, seem to fluctuate around new people. The amethyst strengthens the bond between two people in a monogamous romantic relationship because it represents self-control. The qualities of someone born in February are honest, loyal and humble, because of the gemstone. February gemstone people are romantic in their thoughts but sometimes have difficulty demonstrating this. They are good at creating big gestures, thinking of fun activities and wonderful gifts. But those with the February birthstone sometimes need to be wary on a day-to-day basis that they are leaving space in their heads to prioritise their partners' desires as well as the many things they long to achieve. Sometimes amethyst people can be sensitive and easily hurt. They take things personally, especially other people’s wrong actions. They are moral and fair - they don’t get unnecessarily angry because of their calm nature, but if someone steps out of line, those with a February birthstone will stand up for what is right. Though confrontation isn't their favourite activity, they can argue. But, being fair and just, they can admit when they’re wrong, too. 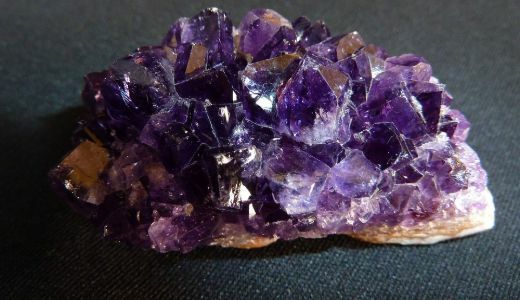 If you have the amethyst as your birthstone, you are independent and value your freedom, meaning sometimes you become rebellious when restricted. You are happy on your own, and enjoy exploring your thoughts. Your general mental well-being is healthy because you have learned to stabilise your restless mind, though sometimes that is challenging. Like the Tibetan Buddhists, practising meditation can strengthen your ability to calm your thoughts. Chances are, as someone with a February amethyst, you'll be a spiritual person as well. People with the birth stone February are extremely creative and are constantly coming up with new ideas, and aspiring to follow their dreams. The amethyst awakens the mind to new inspiration and creativity. February stone people are deep thinkers, they think of all the things they can achieve and discover clever solutions. They are ambitious, not quitters, and do not give up on their dreams. What is the birthstone for February? A calm, peaceful and serene temperance and an imaginative and clever mind are the qualities that make up the February birthstone - the amethyst. People with the February stone have good emotional stability because, like the Greek myth, they are good at protecting themselves from darkness and negativity. People born with the amethyst gemstone know themselves well, are okay with being alone, but develop strong and exciting bonds with the important people in their lives.